The Belkin 3.5 mm Audio + Charge RockStar™, F8J212 offers dual functionality for charging and listening to your iPhone® or iPad®. Whether you want to charge in the car, on the go, or at home, the adapter makes it possible to listen to 3.5 mm audio and power your iPhone simultaneously. 12 W pass-through charging powers up your iOS device at maximum speed. So, whether you’re listening to music or watching videos, using audio navigation, or taking calls while you charge, there’s nothing slowing you down. The Belkin F8J212 supports any audio jack using the 3.5 mm connector with up to 48 kHz, 24-bit audio output for clear conversations and flawless music playback. 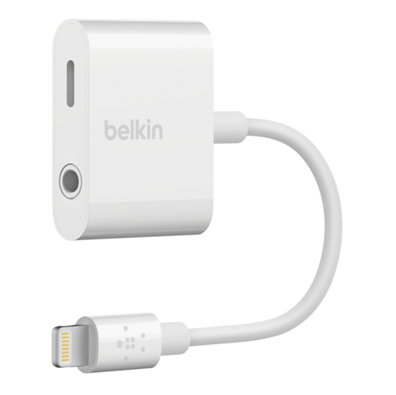 There’s no need to remove your iPhone or iPad case to connect your 3.5 mm headphones or your charging cable since the Belkin F8J212 works with most cases.